Description of "MICROSCOPY OF GOOD AND HAPPY LIVING"
What do we think about the Good and Happy Living? The feeling of happiness or sadness is within us. It is said that happiness is purely our own matter. Though it has got something to do with our external circumstances. But there are certainly some positive factors within us that keep us happy and there is something negative within us also which keep us unhappy. Happy living through positive and good thoughts, is nothing more than that of living a normal life free from undue pressures, problems and tensions. If we want to live a good and happy life then we need to get rid of the negativity within us which makes us unhappy. Negative approach always complicates the problems and increases unhappiness. Most of us do the fatal mistake of looking outwards for happiness rather than looking inwards. Be positive, be strong, be bold and be courageous you are sure to find the feeling of happiness within you. Even if we are having a bad day, think of some good things that may come our way, either later that day, tomorrow, next week, or next moment. Astrology has stood the test of times ever since it revealed the mystery and the mastery of the ancient wisdom of forecasting the influence of the stars on human bodies. 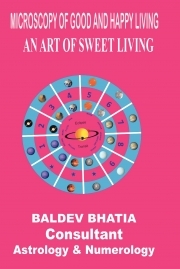 The author Baldev Bhatia a renowned and world famous astrologer has penned several simple books on astrology-this mysterious subject that reveals the true perception of knowing oneself through the art of prediction. Professionally the author has put his entire life experience in promoting Astrology in various fields with a view to serve the millions of curious readers of this mystic science and with the intension of imparting them the real knowledge of astrology through various marvelous scriptures. The author also shares with millions of curious readers the ‘real knowledge’ by letting them know more about themselves in detail and also about their in born positive qualities, possessed by them and guides them to ward off the negativity in them, by getting to know as how to lead an happy and powerful life., without caring for the worries troubling them, the negative forces influencing them, which needs to be discarded forever, for a sweet and happy living if the influence of the transiting planets or if the MahaDasha happens to be unfavorable, negative and disheartening. Parenting Your Teenager by Kavita V. S.
Reviews of "MICROSCOPY OF GOOD AND HAPPY LIVING"